Firstly, the hook was inverted, since this thing was to be designed to bounce along the bottom. So he used a jig hook. Next, it needed weight. So he dispensed with lead wire that adds bulk and used only tungsten. More specifically two tungsten beads: a larger slotted bead, and a smaller bead to be hidden in the thorax. The slotted bead is tied as far forward as one can get it. The second bead is placed backwards (thread it onto the hook, large hole first), and is tied a millimeter or so back from the slotted bead, leaving a very small space between the two beads for later. To give you an idea, a 2.5mm slotted, and 2mm conventional bead are used on a Hanak wave #14 hook. A slim tail of just a few squirrel tail fibres is used. Squirrel tail is very durable, so is used in preference to hackle fibres. Squirrel also retains no air. The body, so as not to be “fluffy”, is from wound “V rib” in small diameters. On the #14 hook, the UTC “midge” size is used. This is wound in tight (stretched) abutting turns up to the small bead, and tied off with enough silk wraps to form a built up area behind the bead. Then a single strand of peacock herl is wrapped over the smaller bead, obscuring it. Two turns is usually enough to do this. The peacock herl is tied off in that narrow space that we previously left between the two beads. Then a small and sparse black CDC feather is chosen. It is important to choose one with a slender stem. An alternative would be to apply the CDC in a spun loop, but so little of it is required, that it is hardly worth that effort. Instead Andrew normally ties in the feather, then applies some superglue in order to be able to wrap the stem into a bed of glue. Then comes the important part: wrap the CDC a single turn. In fact if the feather is more dense than you expected, use just half a turn. CDC is a floating fibre, so we don’t want to overdo it. 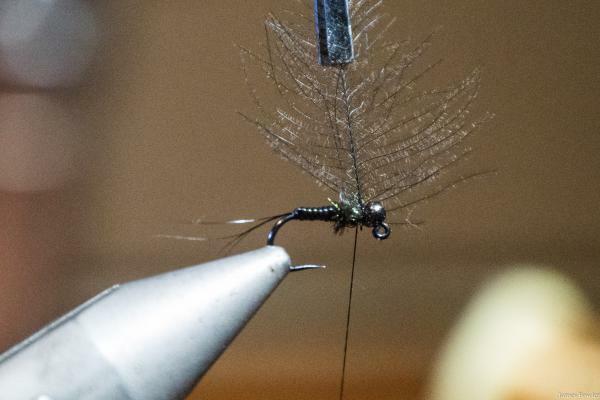 Different fibres, with less propensity to trap air could have been chosen, but CDC fibres move so well in the water, and provided they are tied very sparsely, they certainly won’t even begin to slow the sink rate of the fly. Trevor Sithole was watching this fly being tied recently, and when he looked away for a moment, and then regained his focus on the vice, the fly was complete, and he remarked “What! Is it finished already?” Therein lies the beauty of the thing. It is dead simple and quick too tie. When it comes to fishing it, it is best left tucked safely in your fly box until you get to either an enormously deep pool, or when the flows are up, the spot where fast water enters a glide or pool. With the small bead size, the “plop” factor is somewhat diminished, but nevertheless, when used in rushing white water, it comes into its own. It is at its very best when you arrive at one of those plunge pools below a cascade of white water. Thrown directly into the fluffy tumble of bubbles, it cuts through the water, descending to the hidden quiet water beneath, where trout are so often waiting. Tied on #14 and #16 hooks, this fly can be thrown with a 2 or 3 weight, and need not diminish the lightweight experience of a small stream expedition. 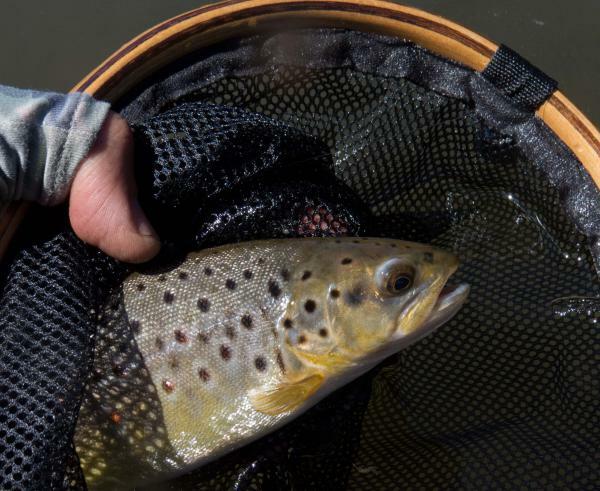 You can fish small unweighted nymphs and dries, and then upon arriving at a spot that calls for the Troglodyte, switch over to a small one, even on a 6X or 5X tippet, and toss it in right at the top of a rushing chute or into the churning water below a small fall. 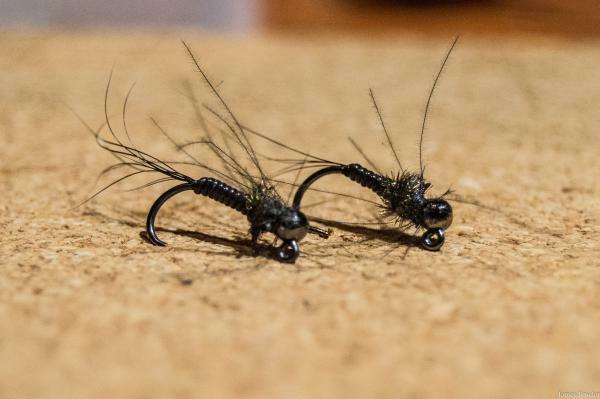 Tied in its dark colours (dark brown or black), the fly is particularly effective, and probably represents baetis or heptagenidae nymphs, which are so prevalent on many of our streams.